We first met in 2013, while attending one of her dancing classes. Besides her career in dancing, she is driven by her mission to make people more aware about our planetary challenges, about their environment and especially about themselves. Mia discovered soon in her childhood the love to dance, out of which her passion formed itself. The fascination for different dance styles and the way these unfolded in the body moves fascinated her from the beginning. Therefore, she tried out several dance styles during the first 10 years of her career in dancing. She trained in each of these styles intensively, looking for new dance forms, movements and ways to express emotion, in order to learn how to convey the message in the dance moves. She was fascinated by how one can embody feelings, messages and stories in different dancing styles. 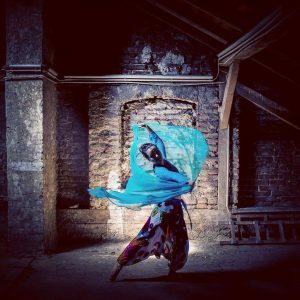 After 15 years of trying out different dancing styles and 20 years of taking dance courses, Mia settled to the Bollywood dance, which also emerged from her interest in India and the Indian culture. This type of dance is particularly rich in various dance steps and encompasses many different dance styles. Through Bollywood Dance, Mia found the best method for her to transmit the joy and happiness emerged from dancing further to her students. The special feature of Bollywood dance is that it is formed out of more dance styles; it is a real fusion dance style where one can explore and try out a lot. It is a lot of fun. Through dancing, people come together; they make friends and are closer to each other.